2016 update: Original artist website tasart.com. Commented below! 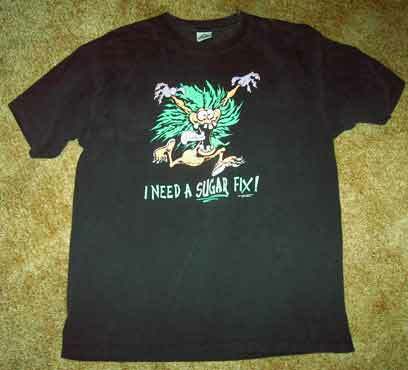 This t-shirt was bought by me in possibly 1994 (going by the date it was copyrighted) in a store like K-Mart (which i think it could have been). The teeth, eyes, and anything else white is glow-in-the-dark. Since my purchase in 1994, I have never seen someone else wearing or know of anyone that has one of these shirts. This page will hopefully solve that problem. If you have any information on this rare peice of clothing or have one yourself, please use the comment area.